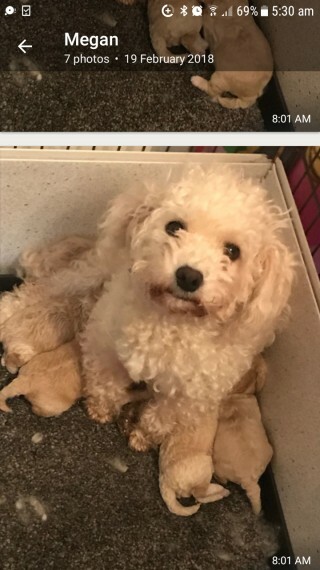 Beautiful Poochion puppies for sale. Mum is a Bichon Frise Dad is a Red/Apricot Toy Poodle. Both mum and dad are family pets. Pedigree papers for both mum and dad will be shown Dad is PRA tested clear. Pups are Cream,Apricot and red in colour. Pups will be fully vet checked microchipped wormed and flead when ready to leave on 30th March. Non-refunderble deposit of 100 taken now for pups of your choice. Pups will leave with a puppy pack including blanket,bowl,food and toys to start them off in their new homes. These pups are great for people with allergies as they are non-moulting. Girls 850 1 girl sold BOY 800 sold PLEASE RING AS EMAILS WILL NOT BE ANSWERED. NO OFFERS TIME WASTERS. GENUINE CALLS ONLY.